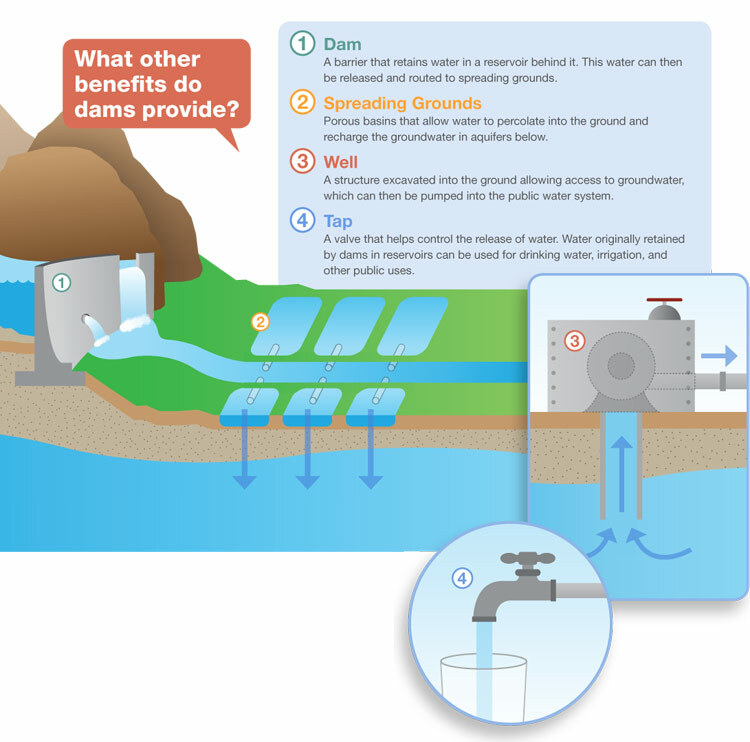 The Flood Control District built a flood control system of dams and debris basins, which interrupted the natural sediment process. Subsequently, Los Angeles was able to build neighborhoods within floodplains and reduce flood risk for residents. Now, although erosion still occurs when it rains, once unpredictable rivers and sediment are diverted into protective channels. Water, sediment, and debris are captured in the flood control system as opposed to spreading into, and damaging, Los Angeles’ vast network of neighborhoods. There are many challenges the District faces while providing flood risk management and water conservation. The Flood Control District is charged with maintaining flood risk management by keeping dams and debris basins operational. 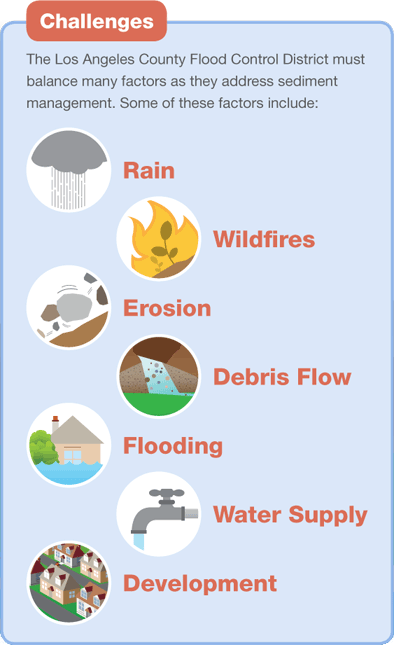 The District’s vast network of flood control facilities helps reduce the risk of flooding where it has a natural tendency to occur and has contributed to the growth of Los Angeles into the region it is today. 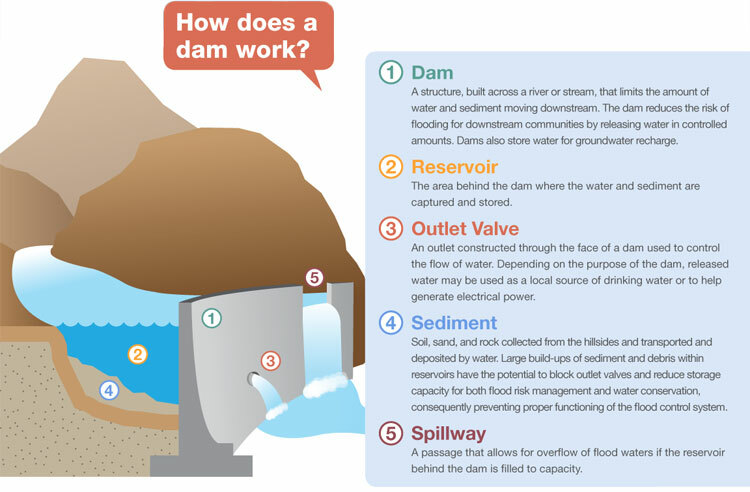 Watch a video about Dams. Reservoirs assist in recharging groundwater which helps Los Angeles retain a supply of drinking water. Water from the reservoirs is released, as needed, and moves through a system of open channels into spreading grounds, where it replenishes groundwater basins by slowly percolating, or infiltrating, into the ground. The groundwater basins are accessed by wells, providing a valuable and reliable source of local drinking water. By conserving water in reservoirs, Los Angeles County relies less on imported water from other areas of California. The flood control system ensures that the greatest amount of water is captured in reservoirs and diverted into spreading grounds instead of being lost to the ocean. Currently, the water in local groundwater basins meets the supply demands for one-third of Los Angeles County households.